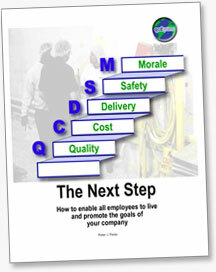 The Next Step book, written by the creator of QCDSM, Peter Paola, enables management to encourage employees to own goals of the company by enabling them to manage their own areas and tasks through continuous improvement. The two key elements of this methodology are the development of authentic procedures by the employees themselves and the daily measurement of achievement against these procedures. The ownership results in a self-driven desire to meet targets and overcome daily issues. 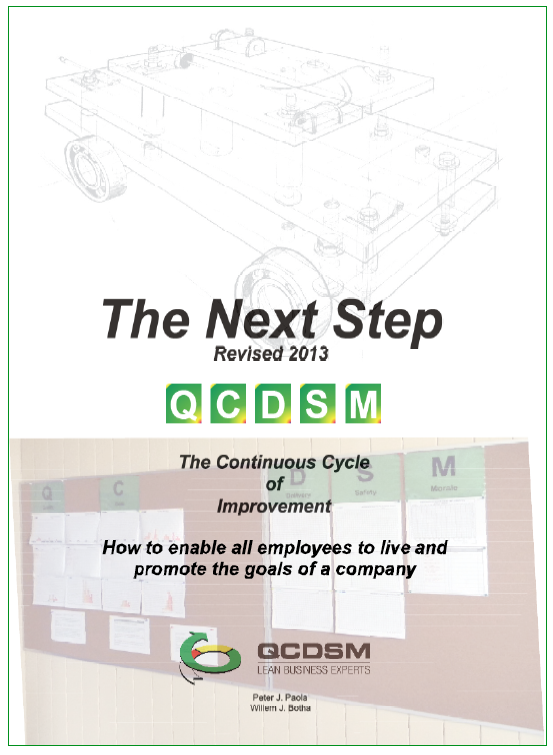 The Next Step is available in paperback print or as a PDF file for download, featuring all the principles and methodologies of the QCDSM Program. The book can be purchased in full color, or in black or white (at a reduced price). The link below will take you to the website lulu.com to order the book in 8.5″x11″ page size. Click below to order the book from www.lulu.com This is a printed 8.5″ x 11″ hard cover manual.Not available in pdf format. For the A4 size booklet, please contact us at info.qcdsm.com and we can offer you a colour pdf version which can be purchased on a plan so that you can distribute it to the selected number of people in the company. Click on this link in this web site to see an email form that you can use.